FoodThoughtsOfaChefWannabe: Where's the BEEF Pot Pie? Where's the BEEF Pot Pie? I figured since I live in Nebraska a "Where's the beef" type title was appropriate. I have been seeing all kinds of different versions of Chicken Pot Pie lately just none for beef. Chicken is my favorite, right down to those little ones in the freezer section of the store. I know, I KNOW, but leave me alone, it is a double whammy for me, I love pot pie and I love the smell inside the freezers at the store. Leave me alone, I will tell my MOM! :) Sad thing is, she would agree I am a freak of nature. She would deny she ever gave birth to me and then claim not that she chose to adopt me but I was dropped off in a basket on her front porch and she felt an "obligation" to me. I swear, I can hear it now. Age has made her a pretty funny chick. Maybe raising 10 kids did it, or oh I KNOW, it was my DAD. God knows being married to him for 55 years would make anyone funny, as a survival technique! Ok, seriously now. This turned out really well. I have been making pot pies forever but decided to cut down on the varieties of veggies I usually use because I have a whiny little kid for a husband when it comes to vegetables. I cut it down to carrots, potatoes and green beans. I like peas and celery and onion as well but....waaaaaaaa waaaaaaaaaa. Need I say more? :) If you choose to add more veggies, you might want to knock back a potato and a carrot so you don't have way more filling then you do pie space! Time to get down to business. You can use store bought gravy if you choose, you know how I feel about fake brown gravy. LOVE. I did use beef stock and just thickened it. Mine isn't the rich brown color I normally like, but if it bothers you throw in some kitchen bouquet or something to deepen up the color. I also used london broil for my beef. Use whatever you have on hand or like, heck you can probably even use ground beef. I mean it would gag me, but you might enjoy it! I did promise to post my crust recipe. It is awesome. I even add cinnamon and sugar if I am using it for something sweet. This recipe will be enough for 2 crusts. There are no real ingredient secrets, the secret is using FROZEN butter and ice water. All ingredients must be kept as cold as possible. When you mix the ingredients you want the little frozen pea size bits of butter to stay that way. When you bake your crust those are the spots that cause flakiness and buttery goodness! 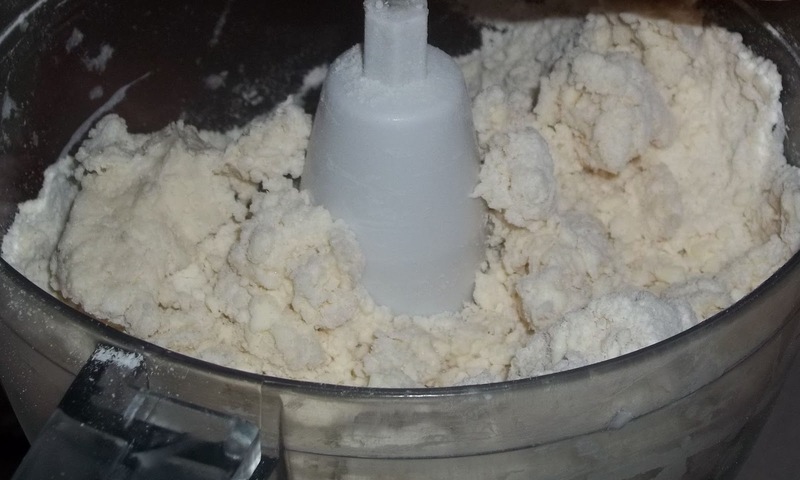 I make this in my food processor but if you don't have one, just use a pastry cutter thingymabober. I don't remember where I got this recipe it has been so long. It is the only recipe I have ever used or will ever use for pie crust! 8-10 tbs of ice water. I just put ice in a glass, fill it with cold water and refrigerate until ready. Put the butter, flour, and salt in the food processor, and pulse briefly just until the mixture resembles pea sized bits of butter. Add the water, 1 tbsp at a time pulsing briefly after each spoonful of water. Keep adding water until the dough just begins to gather together. Transfer equal amounts of dough into 2 Ziploc bags or pieces of saran wrap. Pat into disk, wrap well and put into the fridge and let rest at least 30 minutes. Remove 1 disk at a time to use so it stays as cold as possible until baked. Preheat oven to 350 degrees. In a large pot, add butter and beef, you are looking to cook your beef almost all the way here. Toss it around from time to time, when it stops saying, "MOOO" it is probably done. Remove from the pot and add your potatoes, green beans, and carrots (if you add celery or onions do that now too). Pour in enough beef stock just to cover and simmer for 5-10 minutes. I like my veg to keep a little bite to it, so I go 5. Remember it will bake another 25 minutes too! When your veggies are done, add flour to remaining stock in a measuring cup or bowl, whisk flour in until smooth and pour into pot with veggies, cook on medium until thickened. Add beef back in at this time as well. Cover and cook on low, checking occasionally to make sure it isn't sticking or over cooking. Now for the crust. Take one crust from the refrigerator and roll out to approx 10 inches on a floured surface. Gently roll it up unto the rolling pin and unroll over your deep pie dish. Fit it in and then fill with your filling. 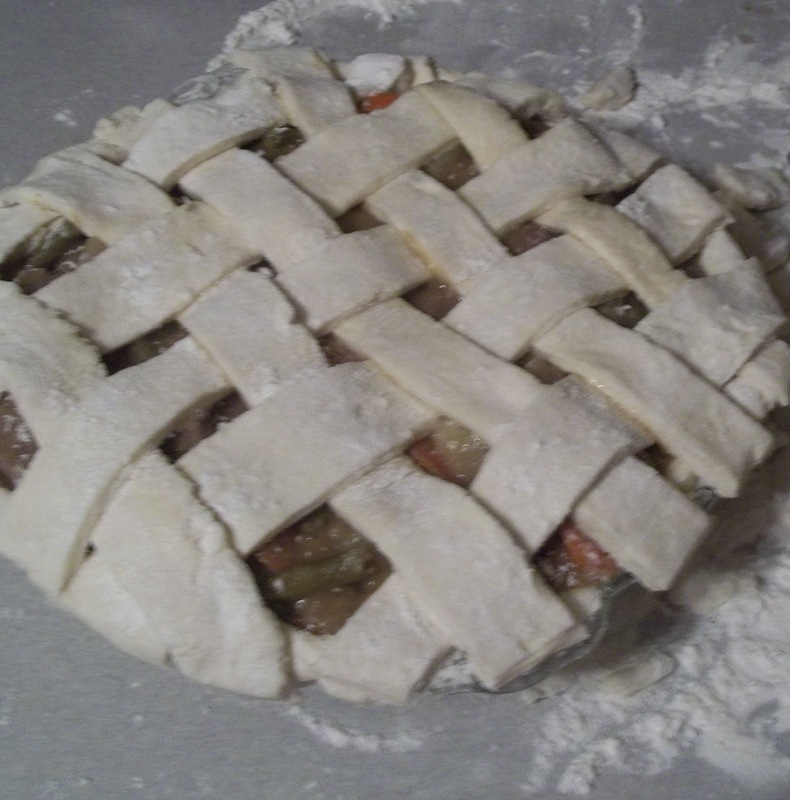 Get second pie crust and you can just place it over the top like normal or you can do a lattice work as I did on mine. Whisk egg and brush entire top and sides of pie. Sprinkle course salt, pepper and parmesan cheese over the top. Place on a pizza pan or cookie sheet in case it runs over. Bake 25-30 minutes until golden and delicious!! This is what SHOULD be for dinner tonight! It's always fun to read your posts :D And I totally agree on the texting and driving subject! It drives me crazy! One time, while on a stop light, me and my Hubs actually counted how many people were on the phone while driving. We stopped after 15... It's sad. Aaaaanyways, onto the pie. I say throw in the onion and celery and we are good to go :) Looks fab, Chris! Hugs! Yum, pinning and making this! We love the meat and potatoes, just use other veggies for flavor! So glad you like it!! Thanks for pinning and let me know how you like it when you make it!! Thanks for stopping by! This sounds amazing!! You mentioned adding green beans, would you use fresh or canned?? About how much?? Would this work baking in a glass dish or should I just leaving it be on a cookie sheet? Thanks for the recipe!! You cold busted me!! I left green beans out of my ingredients! ACK! I added in the measurement, I would use fresh but either would work to be honest! You could use a glass baking dish for sure. Use an 9x9 or 8x8. Just lattice the top the same as you would a round pie! Enjoy and thanks for reading! I LOVE BEEF POT PIE!!! It's my favorite! Please tell your son thank you for his service and thank you for what you do!